That feeling of emotional exhaustion at the end of a day of seeing patients. Viewing patients as problems to deal with rather than individual human beings who come to us for help. Leaving the office after a day of jousting with insurance companies and explaining to patients why they don’t need antibiotics for a viral infection, knowing that we still face hours of charting that evening rather than enjoying time with our family. Wondering what we’re really accomplishing anyway. As Shanafelt and his group at Mayo Clinic found, 45.4% of us experienced this in 2011. In the last 3 years, the number has shot up to 54.4%. At a recent presentation on physician burnout, I asked the members of a thriving medical group to raise their hands if they had ever experienced symptoms of burnout. Nearly every hand went up. The many years of postponing our dreams as we completed our training, the debt most physicians incur, and the long hours at work (physicians work on average 25% more hours than other professionals) were rewarded with fulfilling relationships with patients, the intellectual stimulation of our work, the satisfaction of helping others, a sense of prestige and belonging to a group of like-minded people. As medicine has changed, these rewards have diminished or disappeared altogether while the demands on our time and the stakes have increased. As the available knowledge expands and new methods for diagnosing conditions earlier are developed, expectations bear down on us more heavily. There is little tolerance for not knowing or missing a clue. Our sense of insecurity and anxiety over an eventual failure or catastrophe form a cloud over our days. In addition to the significant increase in symptoms of burnout, our work leaves us with even less time for personal and family life. In 2011, 48.5% of physicians felt they had enough personal time. That number dropped to 40.9% in 2014. How can we balance the increasing demands at work with enjoyable, regenerative activities outside work if we have less time to do that? As Shanafelt suggests, change must come from both personal and organizational efforts. Organizations must make serious adjustments to promote efficiency and improve physician support. Time saving interventions such as the integration of scribes, flexibility in scheduling work hours and patients, acknowledgement of the importance of physicians’ life outside of work, nurturing a sense of community at work, rewarding physicians for their true service to patients and not simply productivity would help diminish physicians’ sense of burnout. We physicians must become more vocal and demand that our organizations listen and make changes to support our professional mental health. On a personal level, each physician must spend some time understanding their personal and professional values – those activities and principles that make their life feel alive and worthwhile – and then take steps to integrate those values into their lives. For ideas on finding your values and ways of putting them into your life, see this link. Intentionally placing a priority on these activities may improve the quality of our patient care more than reading the latest journal! Mindfulness practices such as meditation are powerful ways to develop self-awareness and redirect negative, self-defeating thoughts, bringing a greater sense of calm and control to each person’s life. (More information on mindfulness here.) Learning to bring attention to the fulfilling aspects of our work enhances our sense of personal accomplishment (see Rachel Remen MD’s 3 Question Journal). Physician groups that provide a mindfulness practice, sharing of experiences and didactic information are proven to improve levels of burnout. Individual physician coaching is another powerful and effective method of developing resilience and recovering from burnout. The Physician Coaching Institute is a great source of information on physician coaches. 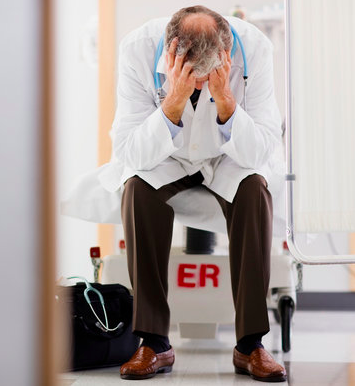 While the rates of burnout are distressing, what’s even more alarming to me is that nearly 40% of physicians are depressed and 6.4% of physicians report suicidal thoughts in the past year. What are we waiting for? What will YOU do about your own and your colleagues’ sense of burnout? This entry was posted in physician burnout, physician coach, physician coaching and tagged medical career, mindfulness, Physician fulfillment, Physician work life balance, Rachel Remen MD. Bookmark the permalink. Yes,I agree with you and impressed with this article. Burn out phenomena is caused because other tensions outside medical practice like professional rivalry, critisising each other,fulfilling unecessary demands of referring physician,pressurise tactics from senior Doctors and lot of internal dirty politics in hospital are other important causes for Emotional exhaustion called “Physician burnout”! Yoga,deep meditation,pranayam, Sudarshan kriya taught in “Art of living” courses at Banglore international ashram,India bt his master Sri sri Ravishankarji-Guruji. Please visit this website – http://www.artofliving.org. I am “Basic course Teacher” of AOL.. Thank you for your comment and for adding your perspective on this problem, which affects doctors throughout the world. I agree wholeheartedly with Sri Sri’s message and vision and appreciate your suggestions that we study practices such as yoga and meditation. They are powerful methods for us to clear our minds of the many stressful untruths that have been passed on and can allow us to practice medicine with kindness, compassion and integrity.